Frank W Gregory was widely regarded as on the foremost authorities on mills and milling in the UK. He was brought up in Brighton and developed a fascination for vernacular buildings, especially windmills, whilst on childhood rambles with his family in the 1920s. This together with an interest in the geology and industrial archaeology of Sussex and the South Downs, developed in his teens, motivated his lifelong quest to discover as much as possible about windmills and watermills and their place in manufacturing and production within the rural economy. A woodwork teacher by profession, Frank travelled widely, visiting, recording, surveying and studying mills in Sussex and later throughout the UK and abroad, mostly for his own pleasure. After the war he carried out mill surveys for local authorities and also for the SPAB Mills Section, which he had joined in 1948. As a keen member of The International Molinological Society he went on many foreign mill tours and his reputation became known worldwide. Printed or higher resolution copies of this image can be made available, subject to a charge. Please see www.millsarchive.org/high-resolution-images for details. Alternatively, a higher resolution copy can be viewed for free at the Mills Archive; please email visitors@millsarchive.org to arrange an appointment. This image is copyright the Weald and Downland Open Air Museum. 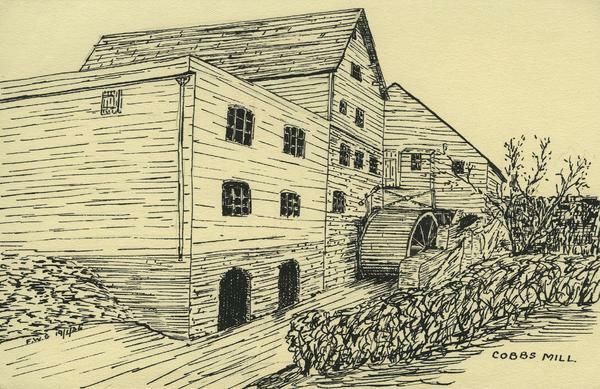 The original is held by the Weald and Downland Open Air Museum.